Lauren started CrossFit in 2012 after a friend invited her to participate in a Fight Gone Bad fundraiser and she experienced her first "Fran Cough." Having been an active athlete in high school it was the first time she experienced that same team camaraderie. Lauren loves the feeling of accomplishment and confidence she receives from CrossFit. 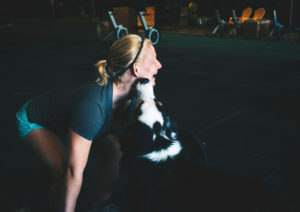 She believes that CrossFit offers people the opportunity to continue to set and complete goals and that has a positive impact on peoples overall outlook on life. Lauren received her Level I on 2015 and additionally completed Strength Specifics Olympic Lifting Certification. In 2010 Lauren earned her Masters in Marine Science. She is currently the Lead Coordinator of the Marine Science Academy at Ashley High School. Work with students in the field of marine science allows Lauren to work with a population of inspiring students and have a positive impact on our coastal community. She can often be found near a body of water with her two dogs, Chance and Conor.